Q: Wait, what is the Appalachian Trail? More fun facts and info can be found here, here, and also here. Q: Wait, are you going to hike that whole thing? A: I hope so. I quit my job and moved out of my apartment and bought a lot of hiking stuff. A: NOBO stands for northbound, which is the direction of my perambulation as I hike from Georgia to Maine. Other options include SOBO (southbound) as well as section (you hike sections of the AT over one season or multiple years). Q: Are you hiking it with anyone? A: I am going solo, but will be starting at the tail end of the hiker bubble, which is the bolus of hikers that begin their northbound trek at around the same time (March and April) in Georgia. 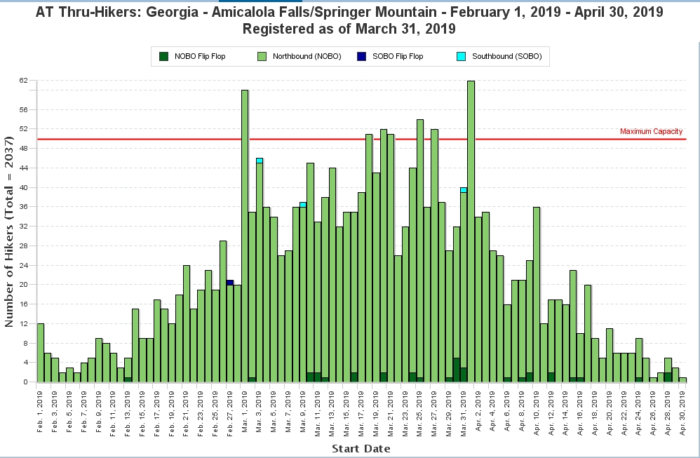 For instance, below is a chart showing that >2,000 hikers have registered their start day in the Appalachian Trail Conservancy thru-hike registration. I am starting on April 12, with 14 other hikers. Additionally ~30 more hikers are starting +/- a day of me. Given that we will mostly be hiking the same distances and camping in similar spots for the night, I will be hiking with many people. A: I’ve been telling people four to six months, but it will depend on how fast I want to hike, if I get injured, how much time I spend in town, and other factors. I’m starting April 12 and need to be done by at least Oct. 15, which is when Baxter State Park in the Northern Terminus of the trail closes. I’m telling myself if I finish by Aug. 1 I’ll go hike the Colorado Trail, but I’m probably biting off more than I can chew with that goal. For a cool interactive heat map of where the hikers are during their thru-hike check out this link. Q: Are you worried about getting robbed or mugged? That sounds very dangerous; you need to be careful. A: The AT is likely less crime-prone that other areas I have lived and where you, dear reader, may currently be living. However, crime does occur in all places and as a result I have taken and encourage other hikers to take necessary precautions in order to minimize theft/danger. Check out the Appalachian Trail Conservancy’s page on safety on the AT. Q: What if you get hurt/lost? I have redundant systems of navigation, including the Guthook trail map of the AT (primary navigation system) as well as a compass and physical paper map (broken up into sections). Additionally, cell service is better than most people would think on the AT, with the possibility of locating yourself by GPS as well as calling for help. I will be camping, for the most part, at designated camping sites along the AT where, presumably, other AT hikers will also be camping, thus conferring an additional level of safety. I have not invested in a GPS beacon such as the Garmin inReach, which is a mini satellite communicator that provides off-the-grid contact to either emergency services or family/friends. I’m still considering getting one even though it will add additional weight (Mom, I know you want me to have one :)). Q: What are you going to take? Are you going to carry everything? Did you buy everything you need? A: Please see this link for an interactive description of what I am taking. Q: Have you been training? How do you prepare? A: Physical fitness: I just finished the NYC half marathon; I do yoga ~4 times a week. Backcountry acumen: I’ve been on multiple week-long hikes and am moderately comfortable in the backcountry. Q: What are you going to eat and drink? A: Thankfully, I’ve been blessed in that I am not a fussy eater and don’t tend to get bored with eating similar foods/food textures many days in a row. I’ll be eating a lot of oatmeal, PBnJs, and some hot foods that can cooked quickly (top ramen, instant rice, Knorr mac n cheese). I am gladly taking donations of the fancy Mountain House brand foods. For water I will be filtering my water through two systems, which offers redundancy. First I will be using the Sawyer Squeeze, in which water is passed through a 0.2 micron filter, which will eliminate bacteria. Second, I will be using water tabs to eliminate viruses. Q: How are you going to get more food? Q: How will you stay connected? Will you have your phone? A: I will have my phone. I will, hopefully, be active on social media. I will call you, mom, and let you know that I am well. Q: Will you have cell service? A: For the most part. It’s actually pretty easy to get cell service on the AT. Q: Are you going to completely disconnect from technology and be one with the moss and ferns and bunnies? A: Not 100 percent. I hope to keep up this blog 🙂 I also bought a nice camera and would like to take some nice photos. Q: Won’t you run out of battery? How will you charge your phone? Your camera? I will be charging my equipment with the Anker PowerCore 13000 portable battery. It’s actually really great and I currently use it just for normal travel for work. Even if you’re not hiking the AT I encourage you to get one. Anker is a great brand and it’s a solid battery for hiking or non-hiking needs (I’m not endorsed by them; I just like their products). O, Hi! Wow! Thanks for reading my bio! Having been glued to a screen for the past few years crunching Excels and making endless PowerPoint slides, I bailed on my job as a strategy consultant to go sleep in the woods for the better part of 2019. I have my 200hr yoga teacher certification and am running the 2019 NYC marathon. I enjoy Nature with a capital "N", great works of literature, and making people laugh (and/or roll their eyes). Very cool adventure, smart to take advantage of this window of opportunity before life takes over. You will be on my very short list of people I know that have hiked the AT. You will be first and probably last one on the list. Best of luck, beware of those mountain women and remember the saying regrading banjos.